"Being part of the JBF team at our local sale is like being part of a family- everyone serves a person and has a role to play. You volunteer with other parents to help set up, operate, and break down the sale all while having emptied your house of clutter and making extra money on the side. It provides an invaluable service to our community by offering affordable, gently used or new kids clothes and items while putting money back into the pockets of local parents. It’s a win/win! I HIGHLY recommend you join our sale and shop/consign/volunteer with us! " I like the cute outfits and low prices. 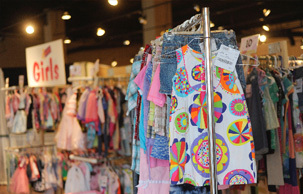 Good quality merchandise gets recycled to someone else when your child outgrows an item. It gives families an opportunity to make things affordable. The volunteers are friendly. I like the choices given to be a participant.